Pitchers who strike out all three batters on nine pitches has been happening more and more lately, but there's nothing quite like seeing it in person. To get more of Joe Sheehan's opinions and cutting-edge analysis on baseball, subscribe to his newsletter and follow him on Twitter. There’s a trope that any time you go to a baseball game you see something you’ve never seen before. I’m sure this is literally true, but as a practical matter, only on occasion do you see something both new to you and amazing. I was at Yankee Stadium on Aug. 2 as a fan, catching the game against the Tigers from Section 320b with my friend Brian, cheering, eating peanuts, catching up on our families and fantasy teams more than I was watching the game as a writer or as an analyst. About seven hours after the scheduled first pitch, after two long rain delays, in front of maybe 2,000 remaining die-hards, Betances struck out Detroit's Jim Adduci, Justin Upton and Miguel Cabrera on nine pitches—an immaculate inning. I’d seen a couple on TV, but had never witnessed one in person. What struck me is how fast it happened. It has to, of course, by definition. It’s three pitches per batter, no balls, no baserunners to slow things down. Think of the rising tension of a no-hitter, condensed from nine innings into nine pitches, and with not everyone quite aware of what is happening. The first three innings aren’t anything unusual. Lots of games reach the fourth without one team getting a hit, like Adduci being wiped out on three pitches, swinging over a slider for strike three. What Exactly Are the Mets Doing After Trading Jay Bruce to Cleveland? As with a no-hitter, you notice it after five. It was when Betances started Upton with two breaking balls for called strikes, the second just catching the outside corner, that I first started thinking about an immaculate inning. I’d moved down, during the delay, to an aisle seat at the top of the lower bowl along the third-base line. When Betances threw a fastball right down the middle that Upton took for strike three, I jumped up and clapped, maybe as engaged as a fan as I’d been with the Yankees since 2009. There was a surreality to it, with night falling on a 1 p.m. game, with a small number of damp, chilled fans scattered around the park, with history 67% made. Then I realized what was coming next and slumped. Miguel Cabrera, one of the greatest hitters in baseball history, was striding to the plate. I won’t lie; after nearly eight hours at the park and a very long rain delay, I’d lost track of the lineups. The chance that Cabrera would strike out on three pitches seemed awfully slim to me. (As it turns out, not so much; Cabrera had 15 three-pitch whiffs coming into the game, about one a week.) The chance that Betances would continue to throw strikes seemed pretty low as well. From where I sat—100 feet away with Cabrera’s body blocking my view—I thought Betances got a break on his first pitch to Cabrera. When I saw it, it looked like a ball to me, a breaking ball that stayed above the zone. Both replay and Brooks Baseball confirm that it was. Dan Bellino, a pitcher’s ump to begin with and having the same long day as everyone else still at the park, called it a strike. This seventh pitch was the key pitch in the inning, just as getting through the top of the lineup in the seventh is the key moment in a no-hit bid. Betances, now ahead in the count, then threw the kind of perfectly-placed fastball that hasn’t been part of his game this year, knee-high and over the outside corner. Cabrera waved ineffectually for strike two. Betances unfolded his body in his deliberate manner and spun a slider down and well off the plate. At 1-1, maybe Cabrera lays off it. At 0-2, he had to chase, and Dellin Betances had thrown an immaculate inning. I’d say the crowd erupted, but both “crowd” and “erupted” would be exaggerations. It’s not clear to me how many people were aware of the significance of the moment, beyond Betances striking out the side, or for that matter, Betances throwing nine consecutive strikes. Even I didn’t know. I thought immaculate innings were uncommon, like cycles or no-hitters. As it turns out, they’re more rare than both across baseball history, though far more common in the strikeout era. Rany Jazayerli peppered me with texts the next morning, letting me know it had happened 86 times in baseball history prior to Betances, but 37 times since 1996 and five times just in 2017. Those numbers increased by one on Wednesday night when the Red Sox' Rick Porcello threw an immaculate inning against the Tampa Bay Rays in an 8-2 win. Eyeballing the list, you can see the influence of velocity and larger called strike zones on the likelihood of an immaculate inning. To see one up close . . . it’s hard to come up with a comp. It takes longer than a monster home run or a nasty dunk, some feat of raw athletic greatness, does. 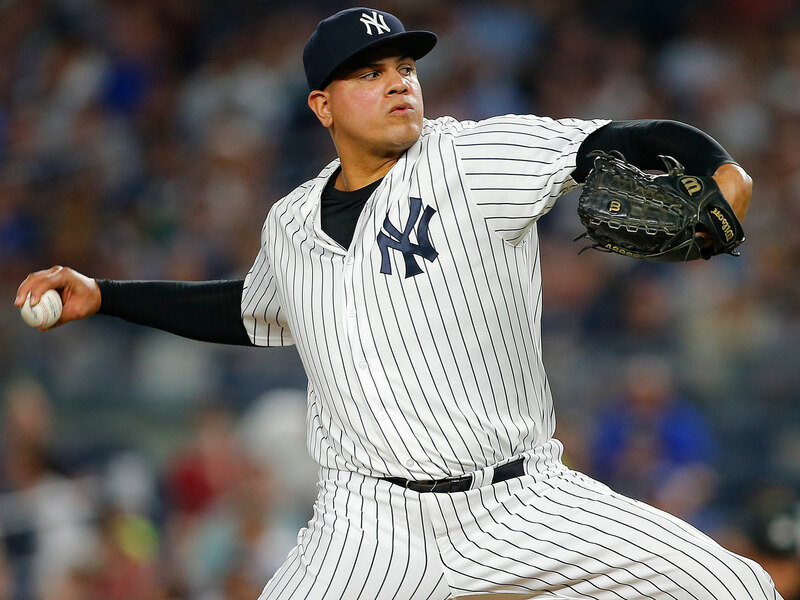 Betances didn’t do one thing to make history; he threw three different pitches, including spotting his fastball for strikes in a way that’s been rare for him this year. The situation wasn’t entirely in his control, either; Bellino gave him a gift on the first pitch to Cabrera, and both Adduci and Cabrera both chased pitches well off the zone for strike three. I keep coming back to no-hitters. The list of pitchers to have an immaculate inning includes some of the great power arms of our era: Max Scherzer, Kenley Jansen and Craig Kimbrel all racked up immaculate innings in an eight-day stretch back in May. Keep looking, though, and you see Rex Brothers and Juan Perez and Buddy Carlyle. Brian Lawrence, who in my memory threw 65 mph, had an immaculate inning in 2002. Doug Jones rolled the ball to the plate, and he did it in 1997. Chris Sale has the best strikeout-to-walk ratio in baseball history, and he hasn’t done it. Curt Schilling and Clayton Kershaw are in that range, and they never did it. The immaculate inning, then, is no-hitter concentrate. Nine innings distilled to nine pitches, and hardly the province of the greats. It’s a display of power and skill, while also requiring some help from the umpire, from the batters. It’s a podcast on 2x, history sped up for quick consumption. And from a seat up against the back wall of section 126, it’s something you’ll just never forget.